magicforum - The Disneyland Paris Forum Community | Walt Disney Studios Expansion Idea! Walt Disney Studios Expansion Idea! Hey, I decided to make a little plan of what WDS might look like in the next 5/10 years. Everything I've put into it is from rumours or confirmed plans. 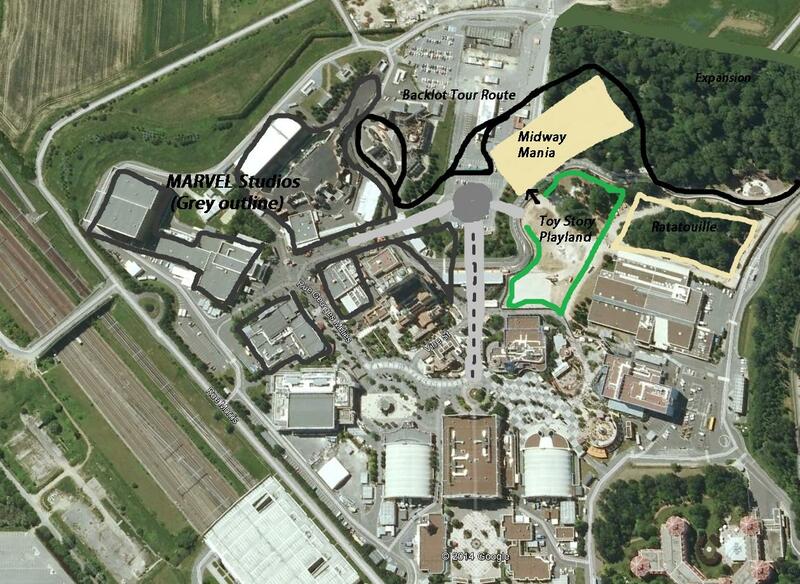 So firstly, Toy Story Midway Mania is built next to Toy Story Playland, with the entrance next to RC Racer. A new hub will be built with spokes leading out to what is now Backlot and Toy Story Playland, through the Domino wall. I moved the backlot tram tour entrance here to minimise change for the ride. Since the Tram Tour has changed a lot, it wouldn't be surprising to expect new additions to it. What would you like to see added? Marvel Studios, outlined in grey, in an Urban area with rethemed attractions. E.g Iron Man in Rock 'n' Rollercoaster and Thor in Armageddon. I saw rumours about an Avengers themed Stunt show, but I'm not sure how that would work. I added it anyway. Don't forget Spiderman is already in the Backlot Cafe area. Re: Walt Disney Studios Expansion Idea! That sounds like a perfectly reasonable plan. And by that I mean something that could actually happen. The Stunt Show could easily be Agents of S.H.I.E.L.D. rather than Avengers, but other than that, I'm all for it. I have an unhealthy obsession with all things DLP.